Goals by Pompey duo Brad Lethbridge and Dan Smith - the latter an early goal-of-the-season contender - helped Bognor to a 3-1 win over Merstham in their Bostik premier home opener. Chad Field also poked one in as the Rocks recovered from the shock of an early goal to lead 3-1 by the interval. 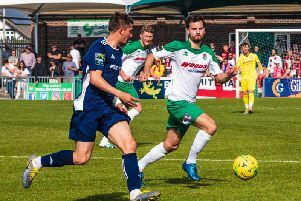 The second half didn't live up to the excitement of the first but Bognor held on reasonably comfortably to claim their first win of the season and go sixth in the table. It was a first home game back in the Isthmian premier for Bognor following their one season in National South. The Rocks began their 2018-19 campaign with a 2-2 draw away to Haringey while Merstham started with a 3-0 home defeat to Tonbridge. Merstham began strongly, dominating possession in the first few minutes and carving out a couple of half-chances. They were playing almost all the football and it was no real surprise when they went 1-0 up on 12 minutes, Richard Pingling running at the defence after a loose pass and releasing full-back Gus Sow, who ran on, drew Dan Lincoln and slid a nice finish past him. Sow threatened a quick second two minutes later when he got away down the right but his ball into the box was defended. Two minutes later Lethbridge marked his Rocks debut with a goal, sidefooting past Chris Haigh after Calvin Davies played him in on goal. The balance of play had evened out and after the two goals it was settling into a keenly-fought contest. A brilliant save by Lincoln stopped Merstham going 2-1 up on 24 minutes as Tom Howard hit a shot goalwards, and then Pingling's follow-up was stopped on the line by Davies. The resulting corner was fired goalwards but was blocked inadvertently by a Merstham player. Lenny Beaney was lucky not to be booked for taking out Rocks skipper Harvey Whyte 30 yards from goal and when the free-kick came in the keeper couldn't hold it and Field was in the right place to touch it in - almost apologetically as it trickled past Haigh. It had been a great turn-around by Bognor after a tricky opening 12 minutes but could they get more goals? They very nearly did as Davies crossed after a quick free-kick by Doug Tuck and Smith should have buried a header from five yards after Lethbridge headed on the ball in. Immediately Smith fired over on the half-volley after a Lethbridge cross from the left - and Merstham looked rattled. On 36 minutes it was 3-1 and it was Smith who scored a sublime goal.. A lightning-quick Rocks break saw a perfect low ball through the middle by Tuck to Smith, who raced on to it and spotted Haigh off his line, chipping him to the delight of the home fans. It could take a bit of beating in the goal-of-the-season stakes. Edwards was booked as Merstham went on the attack to try to recover from the blows they had taken, to no avail. The Rocks began the second half as they'd finished the first - on the offensive. A couple of corners put Merstham on the back foot but came to nothing - while the visitors had a couple of forays forward themselves that gave the Bognor defence something to think about. Marley Ridge came on for his home debut, replacing Edwards, who seems a little short of match fitness still, nine minutes into the second half. Jimmy Muitt hurt his foot in a block tackle as he went to shoot, and looked in some pain, requiring treatment from the physio. He was okay to continue. It was still an absorbing game with the Rocks doing most of the attacking, and Muitt, Lethbridge and Smith were all doing their share of the work in unsettling the Merstham defence. Merstham replaced Kershaney Samuels with Daniel Bennett on 64. The game was becoming a bit stretched with some ragged passes by both sides as the Rocks tried in vain to finish Merstham off and the visitors looked for a second to set up a big finish. On 73 minutes Tommy Scutt came on for Muitt, perhaps struggling a little after his earlier injury. Lincoln made a point-blank save from Howard as Merstham got in behind the defence with a sweeping move - the keeper, who only committed to the cause for another season last week, was certainly earning his money. Merstham brought on Albert Lubango for Reece Hall. Lethbridge wasted a great chance to make it 4-1 on 78 minutes, sending a sidefooted shot well over the bar from 18 yards. Lethbridge appeared to be poleaxed off the ball in a Bognor break and when play was stopped, after consulting both linesmen, Merstham's Harry Osborne was booked. Another quick Bognor counter-attack led by Lethbridge ended in Scutt sending a shot goalwards but it was too close to the keeper. There were no further scares at the back for Bognor and if anyone was going to score the game's fifth goal, it was the Rocks - but it wouldn't come. Bognor are at home again on Saturday, when Bishop's Stortford are the visitors. Rocks: Lincoln, Davies, Edwards (Ridge), Tuck, Wood, Field, Block, Whyte, Smith, Muitt (Scutt), Lethbridge. Subs: Sparks, Heath, Carroll. Merstham: Haigh, Sow, Harrison, Osborne, Cook, Cooper, Beaney, Howard, Pingling, Samuels, Hall. Subs: Bird, Bennett, Lubango, Kavanagh, Henriques.